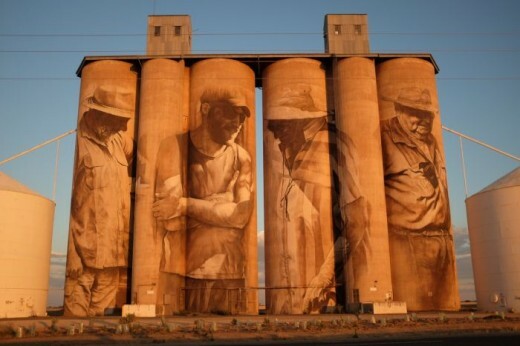 TTN: Australian outdoor mural artists have found a niche in painting large silos with images significant to the town’s heritage. One artist has reported seeing up to 50 sets of grey nomads observing his work each day he was on site. 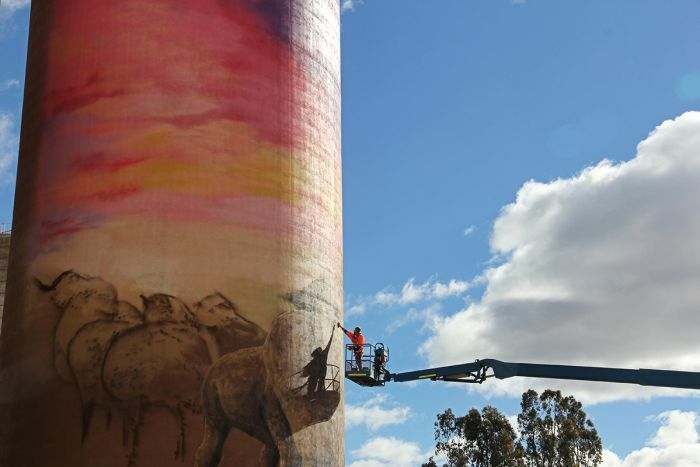 Like the Parkes Elvis Festival that was created to lure city visitors to the bush in the scorching hot summer, the silo art is attracting tourists to small towns that have few other attractions. 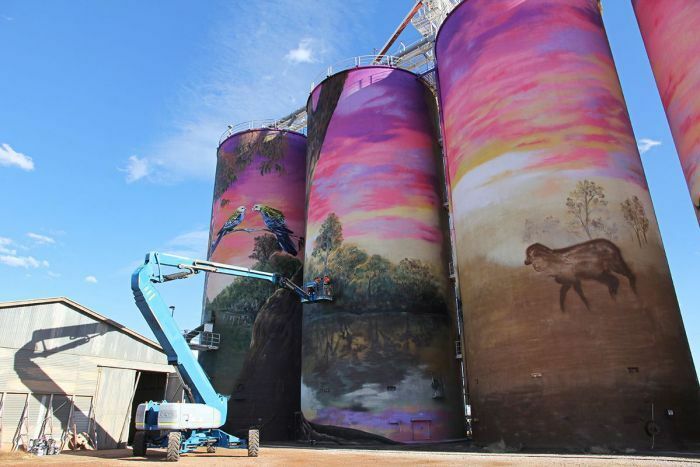 YARRIAMBIACK Shire’s Silo Art Trail (western Victoria, Australia) is continuing to attract international attention, despite there being two silos left to complete. The shire received $200,000 from both the state and federal governments last year for the project. He said they were bringing people to the region from all over the state. “I was up at Patchewollock not long ago and ran into a couple from Ceduna who had heard about the silos and wanted to come for a look,” he said. “In Rupanyup, we also had a few other murals that were painted around town, which also helps bring in tourists,” he said. Mr Campling said Lascelles silos would be painted later this month. When a Brisbane artist decided to paint murals on some defunct silos in regional Victoria, he had no idea of the questions they would create. Guido van Helten has turned the tiny town of Brim, with a population of about 100, into a tourist destination overnight, and social media is cluttered with photos of his work. People are in awe of the four characters, standing 30 metres tall, on the iconic Australian structures. They are questions repeated over and over again on social media, so ABC Rural tracked the characters down. You will not, however, find the real stories of those people here, because Guido van Helten requested the mystery be maintained. “I don’t want this to be about individual people specifically,” he said. “It’s about this place, it’s about the community and, on a broader scale, the whole Wimmera region. It’s a tall order, asking a journalist to keep a secret, but ABC Rural soon discovered the magic of experiencing the same artwork through different eyes. 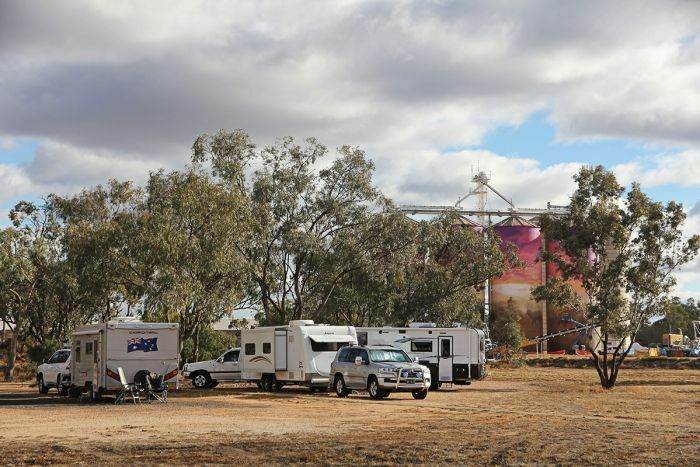 The constant stream of visitors — from Queensland, New South Wales and right across Victoria — shared detailed and often conflicting stories of these Brim silo characters. None of them really know the four people depicted on the concrete walls, but what a story a painting can tell. Is the second man from the left in his early twenties or, as one woman guessed, more like 49? Is there a woman depicted in this work, or is it four men? Are they a family? Is it a tough year? The answer is yes, to all and every impression, because the “real” story of this artwork is in the eye of the beholder. “He’s probably got the weight of the generations behind him on his shoulders,” one observer said of the man featured on the very left silo. Character one on Guido van Helten’s Brim silo artwork. Perhaps it was the 38-degree heat or the dusty paddocks of Brim, which is struggling through a second year of drought, that gave most people the impression this man was in a bad place. “I think he’s probably tired, he’s had enough,” one woman said. “His head’s down, waiting for that rain; it’s a very stressful job, I reckon,” another man said. It seems brown paint on concrete can reveal even more than a moment — some observers could see this man’s entire life. “He wants to keep [the farm] going for the next generations, and wants to keep it going for previous generations,” a woman said. “And his wife hasn’t ironed his shirt,” another woman added. It is an interesting criticism many have shared on social media, especially since the third character from the left is indeed female. Character three on Guido van Helten’s Brim silo artwork. She is certainly not masculine, but she is also far from typical images of women found in the media. “I think they’re assuming she’s a man because of the way she’s dressed,” one woman said. Some rural folk identified with the female character instantly. “It reminds me of Nana Thomas,” one young woman said. So what does this Nana Thomas figure do with her days? “A farmer’s wife, probably retired and living in town now, probably a widow,” one observer thought. “She works in some sort of shop that sells bits and bobs, like an op-shop even,” another said. “She makes scones and looks after the men; gets up and makes their brekky in the morning before they get on the tractor,” said a third. Character two on Guido van Helten’s Brim silo artwork. The singlet and cap being donned by the younger man, second silo from the left, had everyone scratching their heads. “He doesn’t necessarily look like he’s from a farm, he’s got a cap on,” one person said. “He’s been away to college and he’s got all the modern sciences and things behind him and he’s come back,” another said. Many saw a truck driver, but that theory was debunked by one lady because, “he’s got no tatts, the truck drivers often have the tattoos”. But perhaps his very attire tells a story about the changing nature of farming in Australia. “The reason they wear a lot of these clothes now, as opposed to the older fellow, is because you’re working mostly inside cabins of tractors or harvesters,” a farmer pointed out. Not a single person questioned this man’s path in life, who has apparently “lived on the land his whole life”. Character four on Guido van Helten’s Brim silo artwork. But his state of mind is open to interpretation. Most agree it has been a tough life, but is he content or still suffering? “He looks a little bit concerned, maybe things aren’t as good as they should be,” one woman said. “He’s got a lot of character about him and a cheeky look on his face,” another said. “I reckon he likes to go the pub for a drink, just because he looks happy,” said a third. Age estimates varied from mid-sixties up to 97, but everyone was impressed by the mobile phone hooked on this man’s shirt pocket. “That amazes me, he’s got the mobile phone,” one observer said. Before even picking up a paint brush, Guido van Helten spent weeks touring Wimmera farms and getting to know the locals. Brisbane artist Guido van Helten (left) with Brim Community Active Group president Shane Wardle. The city dweller will take his own impression of Brim and its people back to Brisbane. “These sort of towns, I often drove around, but I would just drive straight past,” he said. “I’ve often wondered, what’s it like? What are the people like? Who lives here? Mr van Helten only spent one month in Brim, but the trip happened to coincide with his birthday, Christmas, and New Year celebrations. The temperature also remained above 30 degrees, sometimes nearing 40 degrees, but the artist was in his boom lift every day. “I wanted to originally get this done before Christmas, it was going to be my final thing for the year, but it didn’t turn out that way,” he said. “I got here and it was huge and demanding, but I couldn’t let that go. At the end of each day Mr van Helten pulled up a stool at the Brim Hotel, where publican Rodney Holland “gave it to him straight”. “I don’t treat him as a celebrity, I just treat him like a normal bloke,” Mr Holland said. Brim Hotel owner Rodney Holland with Guido van Helten’s shirt and paintbrush. It has been quite the educational experience for one artist and for the people of Brim. Mr van Helten’s artwork has completely transformed a town, but perhaps the lasting impression will be the unwashed shirt he wore every day — now hanging proudly in the Brim Hotel. And when the work was officially complete, Mr Holland and the locals thought it best the artist experience a “cut out” — a drinking session usually held in the shearing shed when shearers finish their last run. “Everyone kept talking about this term,” Mr van Helten said. 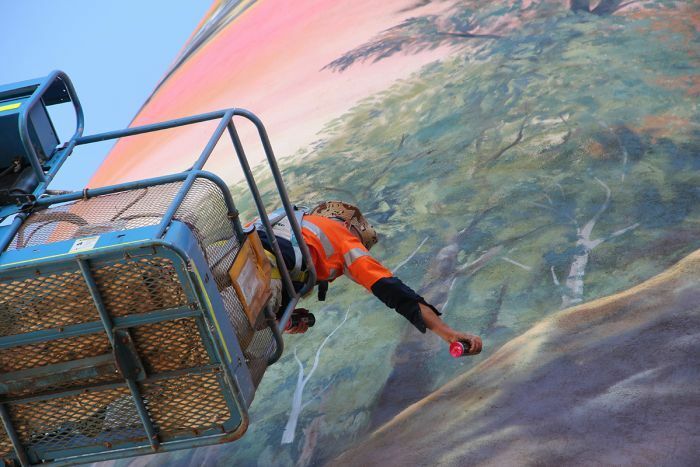 At 30 metres high and taking 500 litres of paint to create, this could be the largest landscape painting in Queensland. Two artists spent three weeks completing the mural on four silos in Thallon. Drapl (Travis Vinson) and The Zookeeper (Joel Fergie) are street art veterans, but say the burgeoning silo art scene might soon need its own moniker. “We’re not really on the street anymore. There’s definitely going to be a new term made for this sort of art,” Mr Vinson said. “It’s a mural. But it’s in a rural setting. The artists worked with local photographers to create an iconic Thallon image with mustering sheep and birds perched on a gum tree near the river. 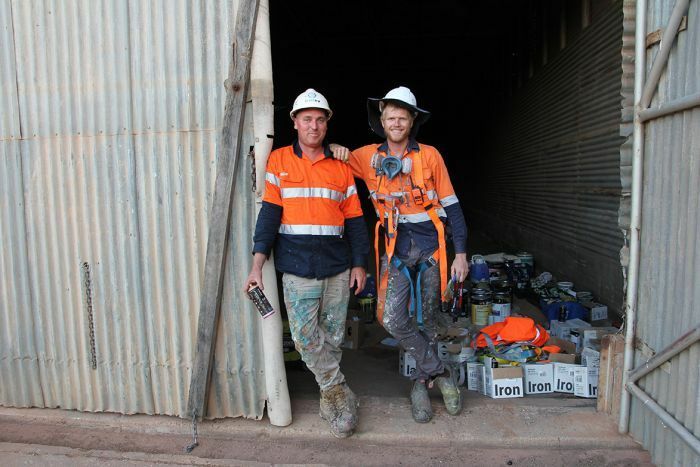 “It’s hilarious … but after after being up there painting a landscape scene all day, we go down to the Moonie River and soak up what we’ve been painting,” Mr Fergie said. The image is a peaceful scene, but Mr Fergie said when he was high up on the lifter and the wind started to blow, it was a less than peaceful feeling. “I really don’t like heights,” he laughed. “But when you work on something like this you know the reward at the end is going to outweigh any doubts you have in your mind. Western Queensland is known for its spectacular sunsets. “People said ‘Oh, did you exaggerate the colours of the sky?’ But when you see a sunset out here, you’ll see just how magical they are,” Mr Fergie said. The painting was finished in the middle of winter, the height of the grey nomad season. “I reckon there’s at least 50 caravans stopping each day to take photos,” Mr Fergie said.